Someone asked me this week if I would ever consider painting lemons. Why, yes! As a matter of fact, I would! After a quick trip to Safeway to recruit my lemon models (I had them sign a contract), they were ready for their photo session. I played Madonna’s Vogue to get them in the mood. A big sheet of white foam core, grandma’s old wooden bowl, and an Iphone provided all the necessary tools. 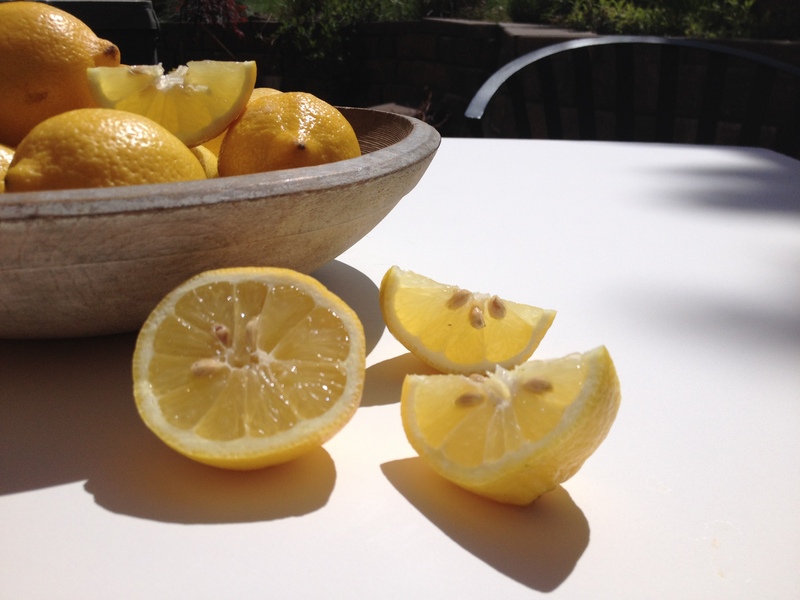 In my back yard, the afternoon sun came in at the perfect angle to create gorgeous lemon light through the lemon slices. After a bunch of photos from different angles and set-ups, this photo worked best because of the connections in the lemon shadows. Since I had planned on doing a small 8×8 Thirty-dollar post, I chose just the three lemons, without the bowl in the background. I’ll come back to this photo for a large painting later. By the way, here is my favorite lemon bars recipe. Sinful, but delicious. Or, you could skip the dessert and go for the Lemon Drop Martini! Lemons in Summer. 8×8 gessoed watercolor paper. Matted with white mat to fit into a 12×12 frame. Here it is! Your Thirty-Dollar Thursday painting! Own it for just $30 (not including shipping). Message me to let me know you want it. First come, first serve. “As the proud new owner of the Orange Chair (which came beautifully shipped and matted today!) I can honestly say that the pictures do not do the paintings justice. Beautiful color and amazing texture and on top of it all, it is frame ready! At this price I may have to break my art rule “the frame should not be more expensive than the art!” A great problem to have.” Check out his great blog about succulents! Beautifully done! It’s so trendy at the moment: attractive blue with yellow! 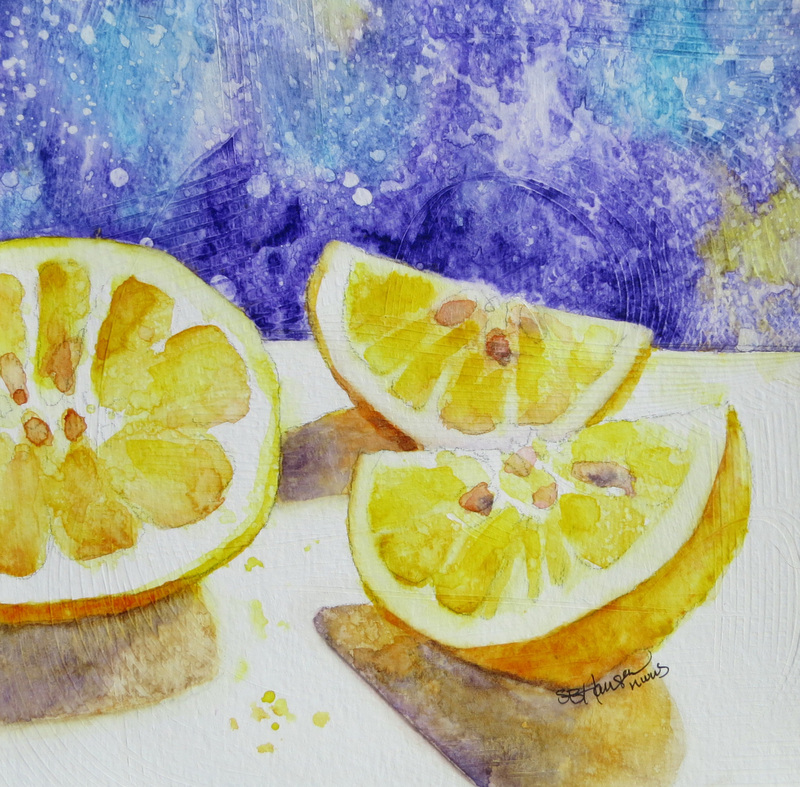 I love painting lemons, as well, they’re very painterly fruits. You approach is amazing, too! Probably takes a lot of time!